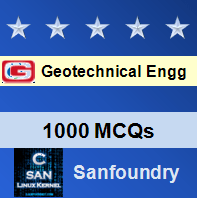 This set of Geotechnical Engineering Multiple Choice Questions & Answers (MCQs) focuses on “Single Grained and honey comb structure”. Explanation: The major force causing deposition is gravitational since the surface forces are too small to be of practical importance. Explanation: Coarse-grained soil may be deposited in a loose state having a high void ratio or in a dense state having a low void ratio. Explanation: Honey comb structure exists in grain of silts or rock flour smaller than 0.02 m diameter and larger than 0.0002 mm. Explanation: Each cell in the honeycomb structure is made of numerous single mineral grain. Explanation: Honey comb structure might be broken down with a resulting volume increase, by driving piles in to deposit of silt of honey comb structure. 6. Which of the following is correct, with respect to honey comb structure? Explanation: The honey comb structure so formed has high void ratio and is capable of carrying a relatively heavy load without excessive volume change. Explanation: Coarse-grained soil of diameter >0.002 mm settle out of suspension in water as individual grains independently of the grain. Explanation: The weight of the grains in coarse-grained soil causes them to settle and get to particle-to-particle contact on deposition. 9. Which of the following force play an important role in honey comb structure? Explanation: The surface forces at the contact areas of the honey comb structure, prevent the grains from rolling down immediately in to positions of equilibrium among the grains already deposited.